As an additional cost to steal Obokata Protocol, the Runner must suffer 4 net damage. When the Runner accesses Obokata Protocol, can the Corp use Tori Hanzō to replace the net damage with brain damage? Does this prevent the Runner from stealing the agenda? The Corp cannot use Tori Hanzō's ability on the net damage from Obokata Protocol because Tori only works on net damage that is dealt by the Corp. I love the flavor here. I'm not a biologist at all, so I'll sum it up in my own words. Haruko Obokata, stylish, brilliant, young, lead the research for stem cells and claimed to have found an easy way to somehow manufacture stem cells - an important thing in cloning. This was made by putting cells under heavy stress, like putting them in an acid bath. The cells were called STAP cells. But Obokata fell off grace when researchers found this to be a scientific fraud and the following scandal even drove her mentor into suicide. The experiments were manipulated, data flawed and images photoshopped. 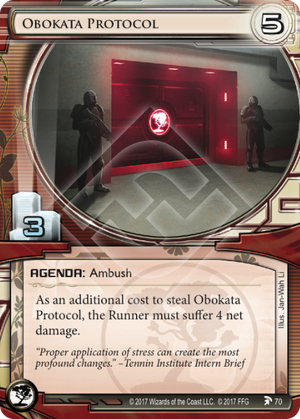 Flavor text on this card is awesome, mixing the Obokata scandal from 2014 with the grim and noir tone we love so much in Netrunner - especially in Jinteki. And indeed, eating 4 net damage sets runners under heavy stress and they likely change their strategy. An agenda which bites back. 5/3's are generally considered difficult to score unless they have an ace up their sleeves. Defending themselves is probably the most important such ace. There's a reason some people play Fetal AI even though it's horribly inefficient (5/2). If the runner has 3 or less cards on hand and doesn't a Film Critic handy it's highly unlikely that they'll be able to steal Obokata Protocol. The damage is dealt before the runner steals the agenda so a flatline wins the game for the corp even if stealing would take the runner to 7 points. If the runner has 4 or 5 cards on hand stealing Obokata Protocol will still sting hard so even if you lose the agenda you don't come out empty handed. For extra security add Ben Musashi to the Obokata server. A total of 6 net damage in order to steal an agenda is going to scare off most runners. And let's not forget Jinteki has a wide array of ice that can make even a cautious runner end up with too few cards in hand to steal Obokata Protocol. Oh and don't feel bad if you send in a Ronin after the runner steals Obokata Protocol. You're Jinteki after all.